The CEO of New York Presbyterian Hospital, Dr. Herb Pardes, recently conducted an interview with a New York news/talk program, Digital Age. It’s well worth watching. Dr. Pardes, a Healthcare Leadership Council member, does a superb job spelling out the impact health information technology is having on healthcare delivery. He also lays out a strong case for national medical liability reform, describing the difference between his state and Texas, where legislators have enacted tort reform. And, he delineates the positive aspects of the new healthcare reform law, while pointing out those provisions, including the creation of an Independent Payment Advisory Board, that need revisiting. The interview is available on YouTube and by clicking below. Some in the news media are simply determined to portray the healthcare industry, or at least individual sectors of it, as strident opponents of health reform, no matter how strongly the facts state otherwise. A recent example came earlier this month when CIGNA CEO David Cordani spoke at a Reuters health conference and said that he did not think it was in “society’s best interest to expend energy on repealing the (health reform) law.” That led to a series of articles expressing various degrees of surprise that health insurers weren’t actively trying to repeal the Affordable Care Act. It would be nice to get this straight, once and for all. No sector of the healthcare industry – and I feel safe in making this assertion since the membership of the Healthcare Leadership Council includes companies from virtually every sector – has stood against comprehensive improvement of the U.S. healthcare system or against making certain every American has access to affordable health coverage. Too often, news reports wrongly describe disagreements about aspects of the new health reform law as outright opposition. We don’t agree, for example, that expanding Medicaid is the best means for reducing the uninsured population, and we have concerns about the impact of the forthcoming Independent Payment Advisory Board. But neither the HLC nor any other major healthcare association has asserted that the status quo should be preserved. In fact, it’s often forgotten that leaders from the health insurance industry were calling for reform and a fully-insured American even before President Obama moved into the White House. To this day, health industry leaders are working to improve the reform law, at the risk of having these actions described as trying to oppose it, repeal it, or undermine it. In actuality, we have deep concerns over any steps that would repeal mechanisms to have more people acquire health insurance, while keeping intact the Affordable Care Act’s health insurance system reforms. That would cause extreme market instability and harmful price increases. So, next time a health industry leader gives a speech in which they say they’re not in favor of repealing the health reform law, let’s not treat it as a man-bites-dog story, ok? Lawsuits as a Growth Industry? An interesting and disturbing article appeared in the New York Times yesterday. The Times and the Center for Public Integrity collaborated on an investigative piece explaining how large banks, hedge funds and private financiers are investing in lawsuits, funneling dollars into litigation – including medical liability suits – they find promising in exchange for a piece of whatever lucrative payout emerges. There’s something very unseemly about this, gambling on whether human misery may generate a generous financial reward. But, beyond the distastefulness of it, this practice leads to a public policy question. Is the public interest served by encouragement, through private third-party financing, of litigation? As imperfect as it may be, current practices in litigation act as something of a check within the system. Because personal injury attorneys work on a contingency fee basis and front the trial expenses themselves, they’re more reluctant to take a case that is completely without merit. (Again, this is an imperfect system, given that 65 percent of claims are dropped or dismissed.) Having available investor financing increases the likelihood that an attorney will press a case as far as possible, thus further clogging already-overstuffed court dockets. The Times article also points out that there are no legal requirements for attorneys to tell their clients about investor involvement in their cases, thus a client would have no awareness that a financial institution or a well-heeled investor may have a voice in the strategies and ultimate settlement of their claim. Many state courts and legislatures have refused to enact any kind of barriers or prohibitions against investments in lawsuits but, given this new visibility, I would expect more attention to be given to this issue. The Washington Post and New York Times are ablaze today with top-of-the-page headlines about the proposals being made by the co-chairs of President Obama’s bipartisan commission on deficit reduction. There may be a bit of an overreaction to the draft report since there’s no assurance it will receive the necessary support of 14 (out of 18) commission members, and Congress is under no obligation whatsoever to adopt the proposals. 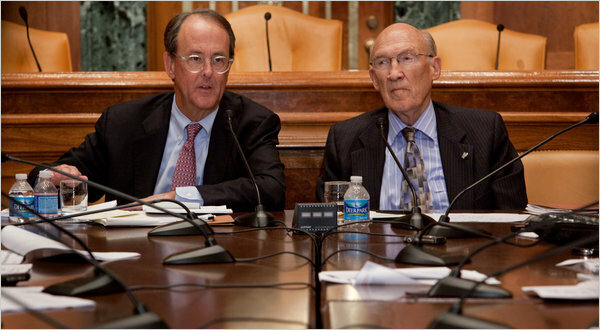 Nonetheless, the commission co-chairs Erskine Bowles, former chief of staff to President Clinton, and former U.S. Senator Alan Simpson deserve credit for taking on the tough task of trying to curb the nation’s burgeoning red ink. Their report doesn’t hesitate to put some political sacred cows on the chopping block in the name of deficit reduction. The healthcare provisions of the co-chairs’ proposals illustrate the difficulty in trying to reconcile two very important goals Americans want to see achieved – reducing deficit spending and improving our U.S. healthcare system. The Bowles-Simpson report illustrates how difficult it is to achieve one without potentially undermining the other. For example, the draft report calls for the creation of a public health insurance option, a policy notion that Congress soundly rejected in the health reform debate. As we’ve discussed ad nauseum, a public option will certainly drive down payment rates to physicians and hospitals, but those costs would then be shifted to private payers. And a public option with arbitrarily-low costs would reduce the amount of competition in the insurance marketplace, a development that wouldn’t serve consumers well. The report calls for strengthening the Independent Payment Advisory Board to an even greater degree than called for in the new health reform law. This would create an even more potent entity in terms of simply axing healthcare spending, but without a focus on how to elevate healthcare value. The report says doctors and other health providers will have to be paid less. At the same time, we’re faced with the need to recruit more people into the medical profession to deal with the tens of millions of newly-insured Americans entering the system. Yes, there is an urgent need to address the nation’s rising deficits, and the health sector has to do its part. But, understanding the challenges we’re facing in the years ahead, with one in every three Americans expected to have diabetes by the year 2040 and other chronic diseases on the rise, we have to look at the healthcare system as more than just numbers on a balance sheet. Work needs to accelerate on delivery reform, on payment reform, on changing the tort system (which, to their credit, the commission co-chairs recommend) to reduce defensive medicine costs, on attacking the chronic diseases that account for 75 cents of every health dollar we spend. But deficit reduction and quality healthcare should not be treated as an either-or choice. The commission’s work is an essential exercise in numbers, but we can’t forget the real patients and consumers who would be affected. …to hold, that is, the entirety of the health reform debate. While Republicans and Democrats on Capitol Hill are still sorting out the reverberations from last Tuesday’s elections and what it means in terms of legislative strategies to repeal or pare back the Affordable Care Act, it’s becoming increasingly clear that the states are going to play their own important role in this process. Texas state legislators, for example, are contemplating dropping out of the Medicaid program and instead creating their own state-run healthcare program for low-income citizens. This is no idle rhetoric. The Texas Health and Human Services Commission is going to release a study within the next couple of months on the effects of ending the state’s Medicaid participation, and the Heritage Foundation has already weighed in with a study estimating that Texas could save $60 billion between 2013 and 2019 by withdrawing from Medicaid and the Children’s Health Insurance Program. This isn’t a step that Texas can take lightly. If a state-run alternative is a smaller, leaner version of Medicaid, hospital emergency rooms in the state could see an escalation in the number of Texas using the ER as a healthcare access point. Yet, the fact the debate is occurring shows the concerns states have about the Medicaid expansion that is a centerpiece of the Affordable Care Act. Texas legislators said that, with the federal government tying their hands on the ability to change eligibility or benefit structures, the program will become increasingly unaffordable. And with Republicans taking over more governorships and state legislative bodies in 2011, it’s very likely that the GOP will flex its muscles on state-level implementation issues, such as those affecting the creation of health insurance exchanges. This was the subject of a discussion on CNN’s State of the Union program this weekend with outgoing Minnesota Governor Tim Pawlenty (R) and re-elected Texas Governor Rick Perry (R). They made it clear that Republican leaders beyond the Beltway won’t stand on the sidelines when the health reform fight re-ignites.